Pallas Kunaiyi-Akpanah goes up for a layup. The junior forward had 13 points and 16 rebounds in the win over Illinois. On Wednesday night, after Northwestern lost its eighth consecutive game and watched a 12-point lead become a 8-point loss, Pallas Kunaiyi-Akpanah refused to look at this season’s silver linings. Challenging her teammates’ lack of confidence, the junior forward said the Wildcats had to make a pretty simple change: play harder and think less. So Sunday against Illinois (9-19, 0-14 Big Ten), the only team in the Big Ten on a longer losing streak, Kunaiyi-Akpanah followed her own advice. She again led the Cats in rebounding — coach Joe McKeown teasingly asked her after the game how she only finished with 16 — and she added 13 points in NU’s 68-61 win. In the first half, she had two rebounds in a single possession before drawing a foul and giving the Cats (10-18, 3-11) an early 9-0 lead. Following the loss to the Nittany Lions, McKeown decided to change his approach in an attempt to solve the team’s lack of aggressiveness. First, he ditched the scouting report the staff had been preparing on the Fighting Illini and instead gave the players breakdowns of their own games. Then, like Kunaiyi-Akpanah did, he told freshmen guards Jordan Hamilton and Lindsey Pulliam they needed to trust their instincts. 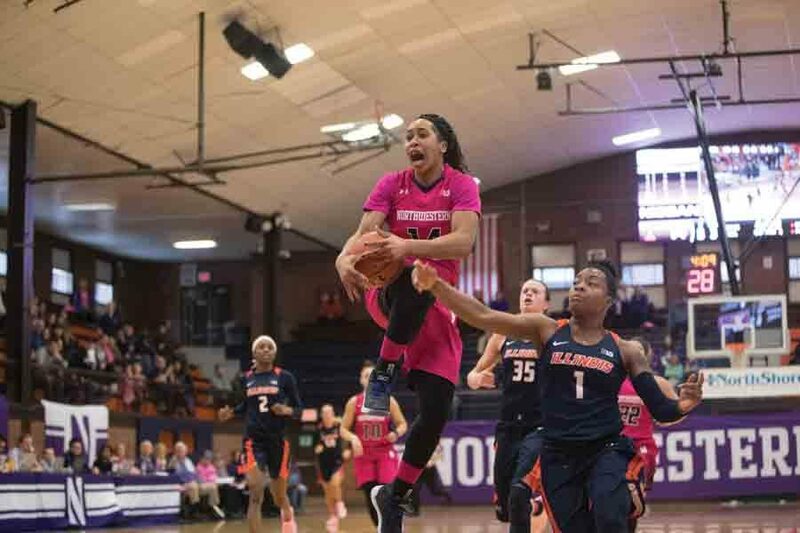 Even though they combined to shoot just 2-for-18 from the field, Hamilton added a career-high nine assists and Pulliam played a major role in breaking Illinois’ full court press. McKeown said their “baptism by fire” is starting to wrap up as they develop into more experienced players. For the first time this season, after holding off a late run by Illinois that cut NU’s lead all the way down to 4 points, McKeown started talking about the team’s collective potential next season. Days after watching a double-digit lead disappear, the Cats strung three defensive stops together in the fourth quarter, and McKeown said their cohesive play gives him optimism about his backcourt. He said Pulliam, who didn’t make a field goal Sunday but remains NU’s leading scorer this year, and Hamilton, who McKeown said isn’t playing her natural position as primary ball-handler, are starting to showcase a chemistry that can thrive in the Big Ten. He joked Pulliam may never lead the conference in assists, but he said she’s showing opposing coaches she can lead it in scoring. McKeown added that Hamilton is starting to force teams to stop pressing the Cats, and her improved playmaking has created opportunities for sophomore forwards Bryana Hopkins, who led NU with 15 points, and Abbie Wolf, who added a career-high 10. And, perhaps most impressively, Kunaiyi-Akpanah approved of the team’s collective effort.